Light–emitting diodes (LEDs) are expected to drive huge growth in the lighting industry. The new high–performance LEDs require a new level of knowledge to manage their higher light output, power requirements, and thermal management. Written by authorities in the field, this practical guide helps readers navigate the day–to–day engineering and systems design necessary to build complete LED systems, offering thorough information on the fields of optical performance, power, materials, thermal design, and modeling and measurement. 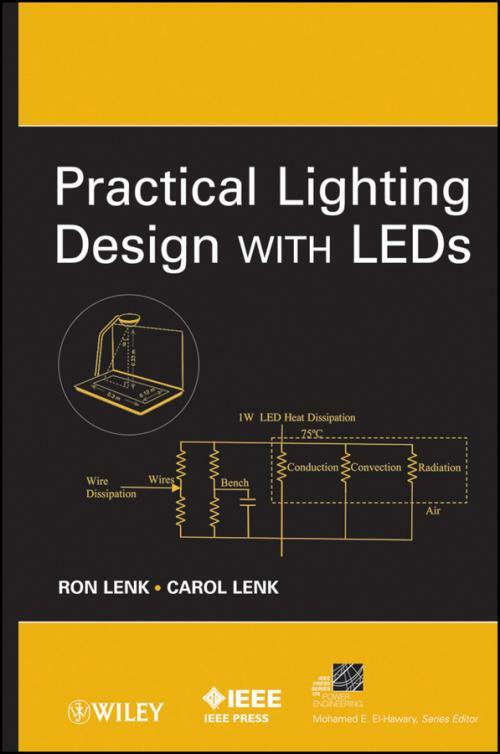 Beginning with background information on LEDs and lighting, the book then provides in–depth exploration of the optical and electrical characteristics of LEDs; thermal performance and how to manage thermals; and DC and AC drive circuitry. It also looks at system performance and gives detailed examples of lighting design using LEDs. Finally, it covers making measurements of LED and light bulb characteristics, and building simulation models of LEDs. This book concentrates on how things are actually done in the lab and in commercial markets. Rather than relying on theory, specific examples are worked out in detail to allow readers to design systems that actually work. Drawings and schematics show how measurements are actually made and how circuits really perform. Everyone from engineers and managers who design LED systems to undergraduates in electronics, electronics lab, and power supply courses to hobbyists will gain the knowledge to implement practical designs. "LEDs are poised to revolutionize the way we light our world, from the flashiest lights on the Las Vegas Strip to the Shanghai skyline. Ron and Carol present a great overview of the LED technology at the heart of these new lighting systems that every engineer should know before applying this technology into the $100B lighting market." 1 Practical Introduction to LEDs. Small LEDs versus Power Devices. Is an LED Right for My Application? LEDs and OLEDs and . . . ? 2 Light Bulbs and Lighting Systems. 3 Practical Introduction to Light. Luminous Intensity, Illuminance, and Luminance (or Candela, Lux, and Nits). Color Rendition: How the Light Looks versus How Objects Look. 4 Practical Characteristics of LEDs. 5 Practical Thermal Performance of LEDs. Electrical Behavior of LEDs With Temperature. Optical Behavior of LEDs With Temperature. Other Performance Shifts With Temperature. 6 Practical Thermal Management of LEDs. Removing Heat from the Drive Circuitry. 7 Practical DC Drive Circuitry for LEDs. 8 Practical AC Drive Circuitry for LEDs. Ripple Current Effects on LEDs. UL, Energy Star, and All That. 9 Practical System Design With LEDs. Designing With the Next Generation LED in Mind. Example: Designing an LED Flashlight. Example: Designing a USB Light. Example: Designing an Automobile Taillight. Example: Designing an LED Light Bulb. 11 Practical Measurement of LEDs and Lighting. Measuring Power, Power Factor, and Efficiency. 12 Practical Modeling of LEDs. Practical Overview of Spice Modeling. IEEE Press Series on Power Engineering.